Rachael Houston of Vineyard Haven died peacefully on March 15, 2019, at the Martha’s Vineyard Hospital, surrounded by her loving family and friends. 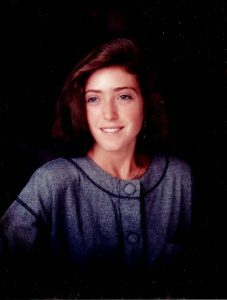 Rachael was born in Falmouth on Dec. 9, 1971, went to Tisbury Elementary School, and graduated from MVRHS. Rachael was an avid animal lover; she rode horses at Featherstone Farm in exchange for cleaning stalls and paddocks, which she enjoyed as well. She dog- and house-sat for some wonderful people who lived Island-wide. Rachael loved being a wife and mother, and provided child care for many years. There was always a house full of kids and something nutritious being served from her kitchen. She moved to elder care, and found her niche in making their lives comfortable. Rachael is survived by her grandmother, Dorothy White of Vineyard Haven, whom she provided loving care for until recently; also by her parents, Pat and Larry Sylvia of Vineyard Haven. She is survived by her husband, Joe Houston; and son Cole of Mashpee; her daughters, Olyvia of Shutesbury, and Mya of West Tisbury. She also is survived by numerous aunts, uncles, and cousins on both sides of her family, as well as best friend Lori Pinkham and her family of Vineyard Haven. A graveside service will be held later in the springtime. Donations may be made in her memory to an Island charity of one’s choice. Arrangements are under the care of the Chapman, Cole and Gleason Funeral Home, Edgartown Road, Oak Bluffs. Visit ccgfuneralhome.com for online guestbook and information. This is so sad…tragic. RIP Rachel. So sorry to hear this sad news, my condolences to her friends and family.